Ayr United closed the gap on Raith Rovers to just two points at the top, taking advantage of the leaders’ short shift at Stair Park, by beating Forfar Athletic 5-0. Striker Michael Moffat contributed a hat-trick and Lawrence Shankland and Craig Moore were also on target as they won at a canter. 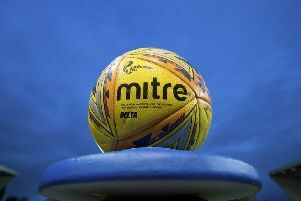 The weather prevented Raith Rovers from preserving their five-point lead at the top when their match at Stranraer was abandoned before half-time due to a waterlogged pitch. In atrocious conditions, Lewis Vaughan had put Raith in front before Scott Agnew drew Stranraer level but it was the last action as the weather had deteriorated since kick-off. Arbroath blew away Airdrieonians 7-1 in the biggest win of the day. Airdrie took the lead through a Ryan Conroy penalty but Gavin Swankie equalised shortly afterwards. Arbroath moved in front when Luke Watt handled in the area and Ryan McCord netted with the resultant penalty and Airdrie collapsed after that. Danny Denholm added two, Bobby Linn, Kane Hester and McCord’s second completed the scoring late on. Queen’s Park edged Albion Rovers 1-0 at Cliftonhill. Thomas Orr put Queen’s Park ahead early in the second half when he knocked the ball home following an Anton Brady corner. Alloa Athletic came from behind to beat East Fife 4-1. Kyle Wilkie put East Fife in front but Paul Crossan equalised with a simple tap-in after 25 minutes and Steven Hetherington put Alloa in front on the stroke of half-time. Andy Graham notched his first goal of the season to make it 3-1 after an hour and Iain Flannigan scored the fourth with a 75th-minute free-kick.